The full walk is about 7km (4 miles) long and takes about two to three hours to complete, depending upon the time spent in gardens. The walk starts at Highbury & Islington underground and rail station and ends at Angel underground station. For a shorter walk, parts of the route can also be started and finished at Angel. All the gardens are accessible to wheelchairs and open to the public during daylight hours, unless otherwise stated. Please be aware of your personal safety and security when walking. Use designated road crossings where possible. 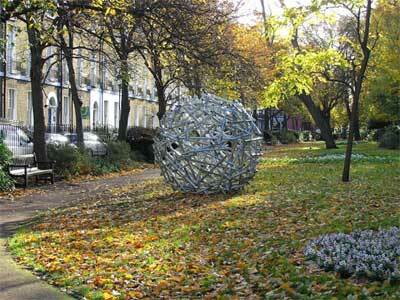 This walk explores some of Islington's many and varied squares and other garden spaces. The 18th-century village of Islington was once a hub of dairy farming, supplying much of London's milk. It was a place of healthy recreation for city-dwellers, with its clean air and the fresh water spas which developed around the New River, built in 1609 to 1613 to bring fresh water from Hertfordshire to London. In the early 19th century, as more houses were needed, country estates were broken up and the second wave of London's great network of residential garden squares took shape. On leaving Highbury & Islington station, turn right and walk to the traffic lights. Cross Upper Street, turn right and then left into Compton Terrace. Enter Compton Terrace Gardens through the gate on the right. Compton Terrace was designed by Henry Leroux in 1805 as a row of villas either side of a Union Chapel, and completed in 1830. In 1823, a management committee was set up, and the 'paddock or grass plot' in front of the villas dressed as a 'pleasure ground'. The Union Chapel Congregational Church was built in 1876-77 by James Cubitt, replacing the earlier chapel of 1806. The terrace and gardens were part of the Marquess of Northampton's estate until the 1920s, when ownership passed to Islington Borough Council. 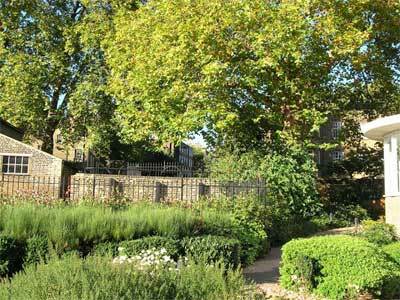 Leave the gardens via the gate at the far end, and turn left into Canonbury Lane. Carry on across Compton Avenue, into Canonbury Square. Pass through the first part of the gardens, then cross the main road at the traffic lights, entering the square by the gate on the right. 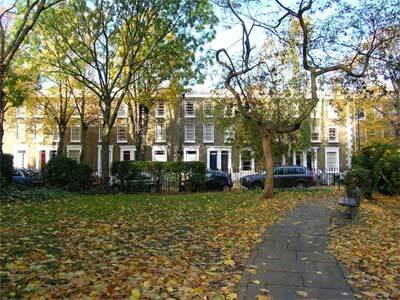 Laid out in 1800, Canonbury Square was the earliest of the Islington squares, and was also developed by Henry Leroux, together with Richard Laycock, on land owned by the Marquess of Northampton. The 4th Marquess of Northampton opened the square gardens to the public in 1884, and in 1888 it was conveyed to Islington Borough Council. The layout of the gardens changed in the 1950s, when it was described as 'London's most beautiful square' by the Evening Standard. The square is surrounded by reproduction railings, the originals having been lost during World War II. The planting was improved by Loire Valley Wines in 2006, with roses, lavender and a small vineyard at its centre. 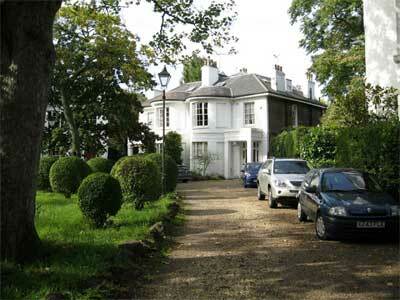 Famous former residents include writers Evelyn Waugh and George Orwell, and artists Duncan Grant and Vanessa Bell. Leaving the square by the same gate, walk south along Canonbury Road. Bear right (crossing Sable Street) into Halton Road. Turn right down Richmond Grove and continue along the pedestrian route into Upper Street. Turn right and cross at the zebra crossing outside Islington Town Hall. Turn left and walk along Upper Street towards Barnsbury Street. On the corner is a small community garden with evergreen planting. Continue along Upper Street and turn right into Waterloo Terrace. Continue into Battishill Street Gardens. The gardens were opened by poet laureate Sir John Betjeman in 1975. In the far corner is a paved area with seating, which features a stone frieze by Musgrove Watson, who also designed the bronze reliefs at the base of Nelson's Column in Trafalgar Square. The frieze was originally made for the Hall of Commerce in Threadneedle Street in 1842. To the north of the gardens is Waterloo Terrace, built on land which was once part of the botanic garden of Dr William Pitcairn, President of the Royal College of Physicians from 1775 to 1785. Milner Square by architect Francis Edwards was never carried out, but was replaced in 1839 with a neo-classical design by architects Roumieu and Gough. Some elements of the buildings were lost in the 1930s, with the removal of projecting porches and decorative ironwork, which blocked light into the basements of the houses, many of which had become flats. 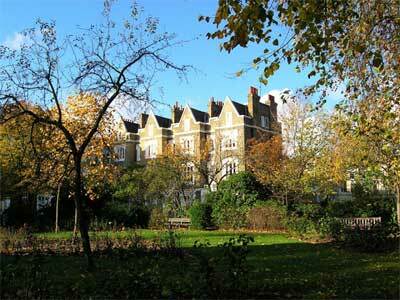 The square became run down and was restored as council housing by Islington Council in 1973. From the passage where you entered the square, continue straight on, turn left into Milner Place, and continue into Gibson Square. Walk to the right around the square to the entrance gate on the left. Gibson Square, the first of two squares built as part of the Milner Gibson Estate, was laid out from 1832 to 1839 by architect Francis Edwards, a pupil of Sir John Soane. 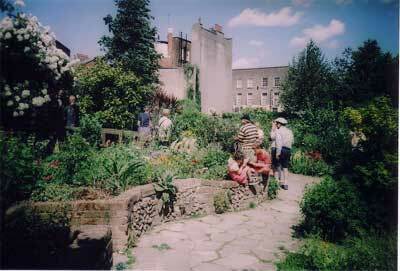 The garden was originally open to residents only, but in the 1930s it had become rundown and was surrendered to Islington Council for upkeep. During WW2 the garden was dug up for air raid shelters and later replanted. In 1963, a proposed ventilation shaft for the new Victoria Line, in the form of a 50-foot concrete structure, was staunchly opposed by residents. This resulted in the simulated classical temple with domed roof which stands in the garden today, designed to be in harmony with its surroundings. The work was carried out in the early 1970s, when London Transport also restored the garden and replaced its railings. Walk diagonally through the garden and leave by the gate on the opposite side. Turn right, and right again into Theberton Street. At the end, turn left into Liverpool Road, cross at the zebra crossing and continue into Cloudesley Square. 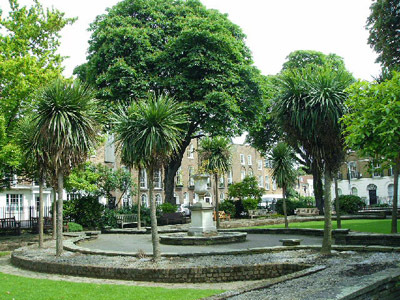 Cloudesley Square was begun in 1825 by carpenter John Emmett, who leased land from the Cloudesley Estate and built along the Liverpool Road from 1824 to 1826. A hexagonal railed garden at the centre of the square surrounds Holy Trinity Church by Sir Charles Barry, built 1826-29, the third of his Islington churches. The square is named after 16th-century landowner Richard Cloudesley, who gave land to the church. The church's stained glass east window of 1828 shows Cloudesley kneeling. Holy Trinity was the district church until the 1850s, when it was replaced by St Andrew's at Thornhill Crescent. In 1980 it was leased by the Pentecostal Sect as the Celestial Church of Christ, at which time the railings were also restored. Walk to the right and right into Stonefield Street, crossing Richmond Avenue into Lonsdale Square. Walk to the right and enter the garden by the gate on the left. 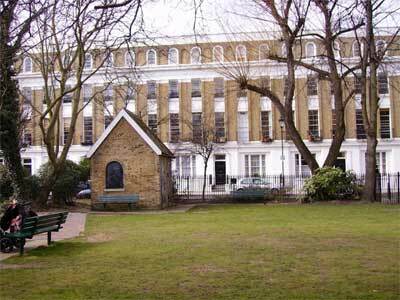 Lonsdale Square was built 1838–45 by Richard Cromwell Carpenter, surveyor to the Drapers' Company Estate. In 1690 the Drapers' Company had inherited the land, known as 'Gosseyfield' and once used to pen cattle on the way to Smithfield Market. 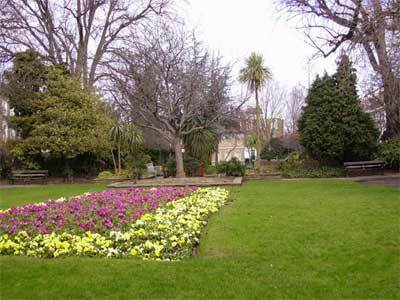 Unlike most of Islington's squares, the garden remained private until the 1960s, when they were offered to Islington Borough Council for the nominal sum of £50. The railings, removed in WW2, were replaced in the early 1970s, when the garden was restored. 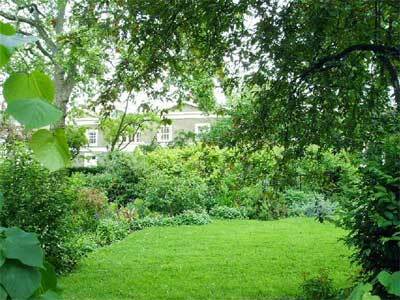 Leave the garden by the opposite gate, turn right, and walk out of the square into Barnsbury Street. Turn left, and left into Thornhill Road. Cross the road, turn left and then right into Ripplevale Grove. At the end, turn right into Hemingford Road and left into Bridgeman Road, which leads to Thornhill Square and Thornhill Crescent. The Thornhill Estate was laid out by estate surveyor Joseph Kay and a number of speculative builders from 1846 to 1852 on land which had been mostly used for dairy farming. 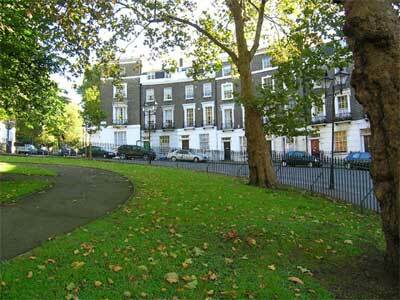 Thornhill Square, the largest square in Islington, dates from 1847. Early residents of the square were well-off professionals and the garden was originally private. The railings, which date from 1852, survived WW2, but the area had declined and in 1946 Captain Noel Thornhill gave the gardens to the council for public use. They were newly laid out in 1953 as part of Coronation Year improvements. Thornhill Crescent was begun in 1849. St Andrew's Church (1852-54) was built at a cost of £6,500 by Francis B Newman and John Johnson, whose design won a competition to build it. 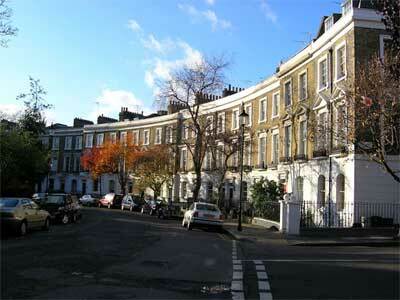 After exploring the square and crescent gardens, go round Thornhill Crescent and into Crescent Street. On the right is the entrance to Barnsbury Wood (open Tuesdays 2-4pm). 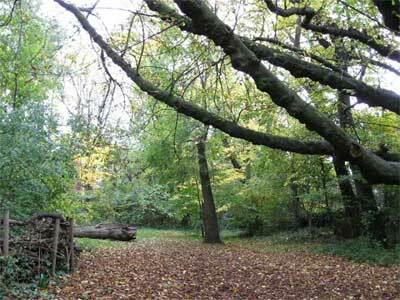 Barnsbury Wood is the smallest local nature reserve in London. The triangular area covered by the wood was originally the garden of St Andrew's Vicarage, at 7 Huntingdon Street, where George Thornhill lived. The vicarage became a private school, then flats, but from the early 20th century the garden was abandoned and became woodland. In 1977 a group of local residents campaigned to save the area from housing development. In 1981, the Barnsbury Wood Co-operative again fought to save the wood from development, and had it designated for educational purposes. In 1996, the wood was granted Local Nature Reserve status, and is the largest area of woodland in the borough. Continue along Crescent Street and right into Huntingdon Street. Turn left into Hemingford Road, cross at the zebra crossing, turn right and then left into Belitha Villas. At the end, turn right into Thornhill Road. Barnsbury Square is a short way down on the right. 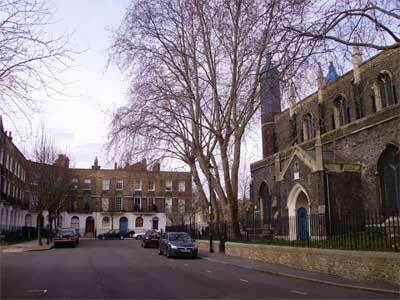 Barnsbury was a medieval manor, and a moated farm once stood on the site of the current square. The name is derived from that of Ralph de Berners, whose family owned the manor until the early 16th century. In the early 19th century, the lord of the manor, William Tufnell began to lease land for development to various speculative builders. The square was central to the Bishop Estate, developed from 1834 mainly by Thomas Whowell, who built and lived in Mountfort Crescent from 1841. 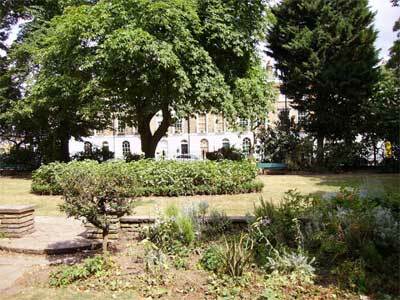 The square gardens were laid out as 'ornamental pleasure grounds' for the private use of residents. In 1889 the Metropolitan Public Gardens Association (MPGA) purchased the lease and opened the gardens to the public, but ownership disputes after the lease expired in 1909 led to decline and damage over the next decade. The gardens were finally conveyed to Islington Council by deed poll in 1933, restored with funds from the MPGA and reopened to the public in 1934. It was redesigned in the 1960s and 70s with raised beds, a small pavilion and new railings. Take the second turning into the Barnsbury Square, enter through the gate on the right and walk across the square to the gate opposite. Turn left and continue to Mountfort Crescent. Mountfort Crescent was built in 1834-47 as part of the Bishop Estate and comprises pairs of bow-fronted villas set around a central garden. It occupies the ground of what used to be Reed Moatfield, in which was a moated site, so described in 1756. It is named after Mountfort House. The architect John Carr McLellan lived at No. 3 from 1883 to 1888. In 1928 the garden was described as a 'small area enclosed by light railings owned by freeholders of surrounding houses, who maintain the garden.' The garden is no longer railed and has several notable trees. Return to Thornhill Road, turn right and continue on. The Albion pub on the left has accessible toilets. Continue on into Cloudesley Road. After the junction with Copenhagen Street, cross the road and the entrance to Culpeper Community Garden is on the right, just after a former pub. To avoid the steps, continue along Cloudesley Road, and enter via the gate in the railings on the right. Named after the 17th-century herbalist Nicholas Culpeper, this secluded garden contains 46 different plots tended by local people and groups, growing a wealth of flowers, fruit and vegetables. There are also a communal lawn, ponds, rose pergola and wildlife areas. Open daily to the public, the project encourages the involvement of many disadvantaged groups, as well as children and young people. Leave Culpeper via the upper gate onto Cloudesley Road, opposite the Islington pub, turn right and cross Tolpuddle Street at the zebra crossing. Cross the Sainsbury's car park into Chapel Market (accessible toilet between the two). Turn left and continue to Upper Street. To end the walk here, cross at the traffic lights to Angel underground station. To continue the walk, turn right into Islington High Street and go to the traffic lights at Pentonville Road. To begin the walk at Angel underground station, turn left and walk along Upper Street. Cross Upper Street and then Pentonville Road at the traffic lights and walk straight on into St John Street. Turn right into Chadwell Street and continue to Myddelton Square. Laid out between 1824 and 1827, the square is part of the New River Estate and named after Sir Hugh Myddelton, who was responsible for building the New River in the early 17th century. The square and St Mark's Church (1827) were designed by William Chadwell Mylne, surveyor to the New River Company from 1811. The church was gutted and the north side of the square destroyed in the 1940s, as a result of WW2 bombing, and rebuilt in replica by the New River Company. The gardens contain many mature trees, seating and raised rose beds. There is a children's playground beside the church. Leave the square at the top right hand corner. Walk along Mylne Street into Claremont Square (not accessible to public). On the right is Claremont Close. Claremont Close was the last square to be built by the New River Company, with eight blocks of flats erected from 1935 to 1936 in domestic revival style around a central garden of cherry trees and standard roses. The site previously contained livery stables, as well as being used to contain cattle en route to Smithfield Market. The site also suffered bomb damage during WW2. 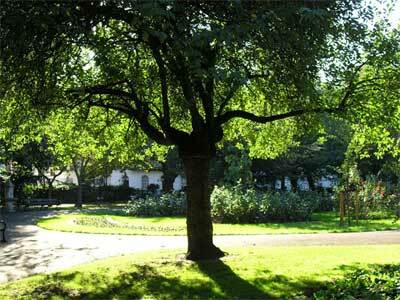 Claremont Square was developed between 1821 and 1828 around the old Upper Pond of the New River Company, built in 1709. The reservoir was covered and turfed in 1852 following the Metropolis Water Act which outlawed open areas of standing water in London. This covered storage reservoir is still owned and in use by Thames Water. The square has its original 19th-century railings. 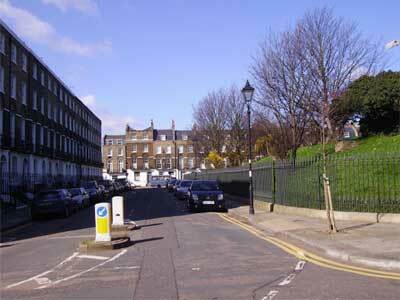 On the other side of Claremont Square, cross Amwell Street and walk straight ahead into Cruickshank Street. Follow the road, which bears left. On the right is Bevin Court, built 1952-5 by Skinner, Bailey & Lubetkin on the site of the bombed Holford Square. At the end of Holford Street, turn right into Great Percy Street, and continue into Percy Circus. To the right is the entrance to Holford Gardens. 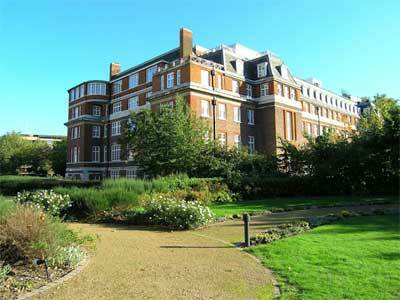 Percy Circus (1841-43) was, like Myddelton Square, laid out by William Chadwell Mylne. It is unusual for its polygonal shape and because it is built on a steep slope. There is a central circular terrace with benches, accessible via steps and a ramp, surrounded by mature trees. The railings are original. Holford Gardens are on the site of Holford Square (1841-44), which was part of the New River Estate and laid out with ornamental gardens. Victorian residents of the square included the painter and engraver Myles Birket Foster, and Edmund Evans, engraver of Kate Greenaway's works. Leave Percy Circus via Prideaux Place. At the end of the road, turn left into Wharton Street and walk up the hill to Lloyd Square (private – open for Open Garden Squares Weekend). Lloyd Square was laid out around.1833 by father and son team, John and William Booth for the Lloyd Baker family, which owned the estate until the mid-20th century. The original layout of paths remains, with trees around the perimeter and a central flowerbed surrounded by smaller beds, planted with shrub roses and perennials. The houses around the square, also designed by the Booths, have distinctive pedimented façades. A garden committee run by residents has managed the garden since 1917, and there has been much recent renovation, including the railings (which are original), paths and planting. Walk around the square, taking care on the uneven pavement and into Lloyd Baker Street. Cross at the zebra crossing and through the pedestrian passage straight ahead to St Helena Street. Carry straight on down Fernsbury Street, passing Greenaway House on the right, to Margery Street. Cross at the zebra crossing and walk straight ahead to enter Wilmington Square Gardens through the gates on the right. Wilmington Square was laid out in the 1820s by builder John Wilson across 16 acres of the Spa Fields Estate, which belonged to the Marquess of Northampton. There is a pedestrian walkway instead of a road along the north side because Wilson ran out of money. 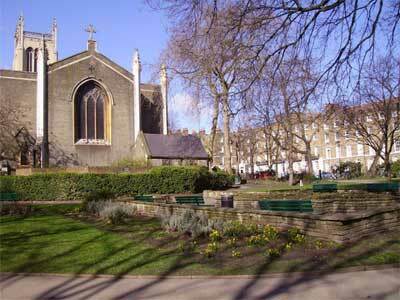 In 1895 the gardens were given to Finsbury Vestry, which planted flowers and installed seating, opening them for public use. There is a late-19th-century pavilion and drinking fountain, numerous trees and conifers, roses and ornamental shrubs. Leaving the square by the same gate, walk straight ahead up Merlin Street. Cross Amwell Street at the zebra crossing, turn right and immediately left into Hardwick Street. On the left near the junction with Rosebery Avenue is the private communal garden of New River Head, former headquarters of the Metropolitan Water Board, now a residential development. Turn left and continue along Rosebery Avenue, past another private communal garden belonging to the Laboratory Building (1936-38) in Modern Movement style. Rose beds and a large fountain are visible through the railings. Sadlers Wells Theatre, ahead of you, has a restaurant, bars and accessible toilets. Turn left into Arlington Way and left again into Myddelton Passage. At the end of the passage, turn left through the second gate in the wall (if open) to reach a viewing platform overlooking the New River Head development. The New River was an aqueduct, built between 1609 and 1613 by City banker and MP Sir Hugh Myddelton. The river was the main source of fresh water from Hertfordshire to north London and the City until around 1990. The water flowed into the Round Pond at New River Head, where a water house controlled supply to surrounding houses. A further reservoir, the Upper Pond, was constructed in 1709 and later developed as Claremont Square. From the 1680s, natural springs around the reservoirs were developed as commercial spas for their medicinal properties. The water house was demolished to make way for the headquarters of the Metropolitan Water Board, which took over from the New River Company in 1904. The grade II listed building, built in 1919 on part of the Inner Pond, is now in private residential use (converted 1997-8), and its garden occupies the site of the Outer Pond. Leaving the viewing platform, turn right out of the gate and go through the adjacent gate (if open) down a ramp into the Nautilus Garden. Return to Myddelton Passage and continue on into Myddelton Square. From here, retrace your steps to return to Angel underground station. The former engine and pump houses of the New River Company form a backdrop to this pretty garden, which features a fountain, pergola and roses. Walk prepared by Sarah Jackson. Care has been taken to ensure the accuracy of information on this page, which is offered in good faith. No responsibility can be accepted for changes that may have occurred since compilation. Please advise us of any changes or inaccuracies you may encounter by writing to LPGT, Duck Island Cottage, St James's Park, London SW1A 2BJ, or email us.